Evening me hugglies well what a funny old day..thick pudding fog!! and a hospital appintment all done and not yet dusted.will have to wait.....my card is a monocrome just fancied a change i have invested in a few copics yeahy!!!! and lovin them...only have a few but found them for 2.49 http://www.yourcreativitystore.com/ so did a little order and local outlet brilliant for the fast delivery i used free ribbons from somewher lol!!! colour image from http://darcysdiaries.blogspot.com/ added lace coloured in with a black promarker..feather from stash bought of ebay ages ago..pearl piece of very old broken headress..and a few flowers from wild orchids....oh forgeot me bow..i did again the easel card and have yet to do the inner but in progress not sure what occassion it could be for.. as she looks a lonely bunnie dosnt she? but cute my papers from hobbicraft & Basic grey...hope the day has been knd to you all and tommorrow it ""FRIDAY"" gosh dont they come round quick...been on a wander through lots of blogs today and wow such yumminess and in awe of them all fabulously delish.... so sassy off for her pills....sassy hugs and love to you all that take the time to coment on my blog it means the world and more...so glad im back..xxxxxxx. 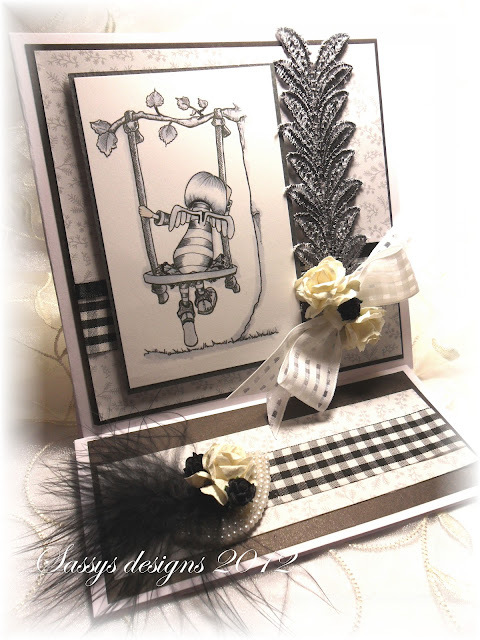 Hi sweetie this is sooooooooo gorgeous I love monotone & you have done it sooooo prefectly I love these images they are fabulous. You have such a fantastic blog hun I love all of your creations. Thank you sooooo soooooo much for all your lovely comments they really made my week hun. Hope all went at the hospital. How beautiful D'Arcy looks in black and white!! Saw your card over on Darcy's and had to come say - wow. 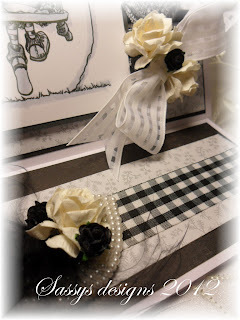 Love the monochrome colouring - gorgeous. Fabulous card. Love all your attention to detail and the monochrome is wonderful. Thank you so much for joining us over at D'Arcys for our first challenge. Hope to see you back again. Wow, what a stunner Sassy! What a beautiful card, you are so creative! I'm a new follower and hope you'll follow back. Have a great weekend. I just adore your card, it's beautiful. The image is perfect as are all your embellishments. Love the feather. Thanks for playing along with our 1st challenge over at D'Arcy's Diaries.